Almost One Year Postpartum....What I Wish I Had Known in Labor. This time last year I was in labor... okay actually that is a lie I never actually went into labor with Ophelia. My water broke while we were out walking around watching the eclipse on August 21, 2017. I of course gave all the credit to my weak bladder and assumed I had pee'd myself and we continued in our day. It was a Monday and Ben was off work so after we walked home I changed into clean underwear and we took Jessamyn to the aquarium as anyone whose water had broke would do...just kidding actually at the aquarium it became increasingly clear I had not pee'd myself. SO we called our insurance and tried to get an appointment that day so I could be checked as I was still pretty convinced my water had not broken and I wasn't in labor. At that appointment they confirmed that yeah... it definitely wasn't pee and we should maybe think about getting to the hospital. They actually were a little more firm about the hospital part but being the rule breakers we are we went home, packed our over night bags, called our babysitter, AND got Ben Chicfila all before heading to the hospital. I wasn't actually having any contractions so it all honestly didn't feel real to me. Our nurse through the first half of the night was literally an angel. She stood with me and just listened as I shared my fears and frustrations and confusion as to why my body wouldn't go into labor and how scared I was. She literally just held me and let me cry as I just kept saying " I am trying, I am trying" I was so terrified that things were not progressing. My doctor was super busy so I didn't see much of her through the night but honestly every time she came in she was so encouraging and didn't seem alarmed at all by my little progress. Having a pitocin induced labor was hard... the contractions were all over the place and super strong it felt like my body was a complete stranger and I was not grounded at all. I think it was about 5am in the morning they checked me again with no progress and I lost it.. I was just bawling. The nurse suggested I sleep and I was so tired at that point I agreed to. They gave me an epidural to help me relax and honestly it was horrible for some reason I only went numb on one side and the sleep I got was like a half crazed painful dream but only on the left side of my body. They checked me again around 11am and I was still only 2cm and getting literally to the point where I just didn't care anymore I just wanted to have a baby and be done. I can't remember if I fell back asleep or what but suddenly about 45 minutes later I felt the urge to push like nothing else! The nurse was super skeptical but when they checked me I was complete and it was baby time! So with Jessamyn I had an epidural and it worked and was awesome... this time not so much pushing oh my gosh... was the most painful experience of my life. I think I asked to quite like 10 times... but my body did what it had to do and she was out quickly and healthy and I didn't even tear, which had been another one of my many fears. ps. I should also mention that Ben was amazing through all of this and so encouraging. Looking back at this birth I wish I had trusted my body more... even with pitocin and the craziness of having my water breaking with no labor.. Even with the hard irregular contractions and my overwhelming fear of having a c-section. 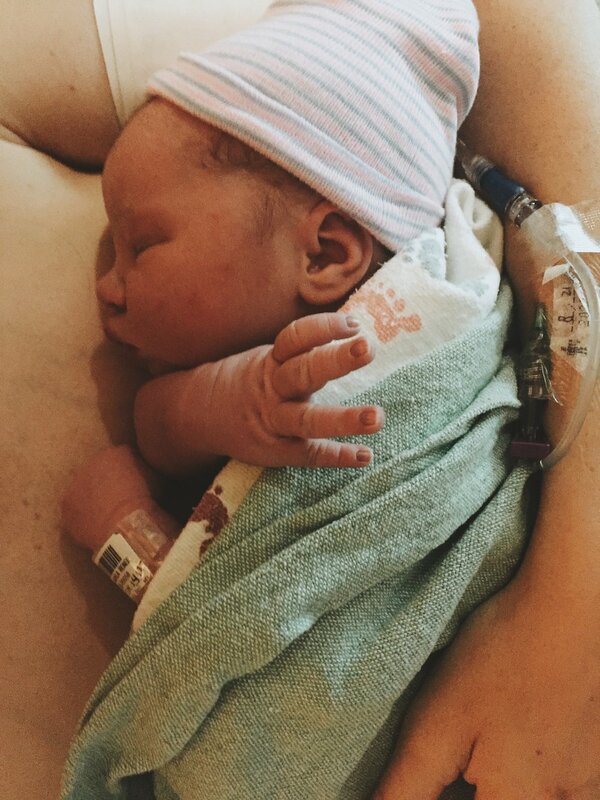 I let every mantra, birth book, yoga class, everything fly out the window because this labor experience literally felt like it had been flipped on its head. (Jessamyn's was literally like a text book labor and delivery) I let all my emotions and fears take control and honestly looking back I mostly remember being so afraid and feeling so alone. If I could whisper anything to myself that day one year ago when my water broke it would be "trust your body, trust the process." Birth however it looks is so different even if you have given birth before and I let my fear of the unknown take over. I look back now and I see a strong mama who just wanted her baby to come into the world in a peaceful and beautiful way, a mama who would have done anything to make sure her baby was safe. BUT I also see a mama who didn't trust her body and my heart breaks for myself and the fear and intense emotions I felt through that process. SO one year out I look at Ophelia's birth and see so much beauty and so much fear. If I could say one thing to every pregnant mama no matter how many babies she has had I would say, "you are stronger than you know and to trust your body." This journey of giving birth is not something you can control even with the best planning but that is okay because your body knows the way even if your mind doesn't. Even the most intense of emotions can't change the fact your body knows and it will see you through... and honesty no matter the interventions, no matter how the plans change, birth is beautiful and you are strong. ps. 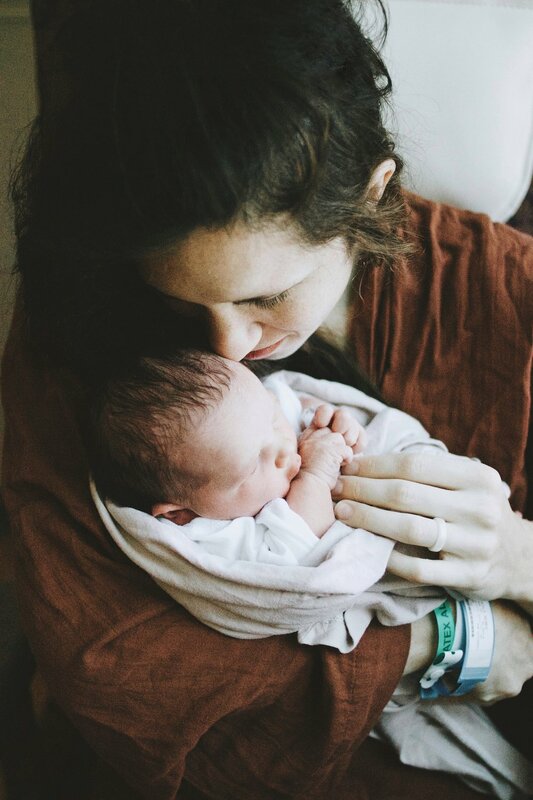 You can read Ophelia's Birth Story HERE. and Jessamyn's Birth Story HERE.